QROPS in France – If you are considering retiring to France and conducting a UK pension transfer, it is important to examine how your pension will be treated in terms of French taxation. Unlike the UK, where the lump-sum portion of your pension benefit can be taken tax-free, there is a tax levied in France. Pension lump sums are taxable in France if they are received from either a French fund or an overseas pension fund. The tax incidence for the individual depends on whether the original contributions to the pension were tax deductible or not. If the contributions obtained tax relief on the way into the pension fund, as happens in the UK, then the lump sum is eligible to be taxed as pension income in France. Pensions that fall into this category would include occupational, stakeholder and personal pensions, where tax relief has been granted against contributions, or the lump sum is tax free. Under the Double Tax Convention between the United Kingdom and France, ‘government service pensions’ remain taxable in the UK. However, income derived from such pensions needs to be declared and is taken into account when calculating the rate of tax payable on other French source income such as interest on invested capital. There is a deduction of 10% for the pension fund with a ceiling of £3660 before becoming liable to French tax. There are also social charges applicable to pension income of 7.1%. Such charges are an additional form of income tax on people resident in France that are not yet retired. It is possible for UK nationals to avoid such charges provided they are covered by the UK national insurance system. 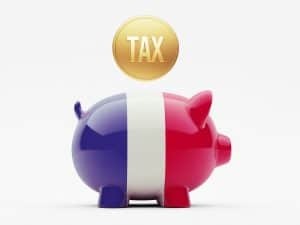 Recent developments in French legislation allow individuals the option of taking the whole of their UK pension in the form of a lump sum with them to France and be taxed at a fixed rate of 7.5%. This fixed rate option is called the prélèvement forfaitaire libératoire. (Article 163 bis Code général des impôts).